Jewish Exponent, June 6, 2018. Click for full report. Ernie Gross is a Holocaust survivor and surely one of the strongest people you’ll ever meet. At age 89, his life is filled with activity and purpose. He reads Torah at a local minyan twice a week. He is a Holocaust education lecturer who takes seriously his obligation to share his story, painful as it may be. Most days, you’ll find Gross having lunch with friends at the Jewish Federation-supported KleinLife, where he tries to brighten each person’s day. “I make sure every day I make 10 people laugh,” Gross said in his Romanian accent. “Even people I don’t know, I go over and show them this,” he added, taking from his pocket a laminated card that reads KEEP SMILING. Sitting on the couch of his Northeast apartment where he lives alone, Gross explained that he constantly extends himself to others because his life experience has taught him one lasting lesson: “Everybody counts,” he said. In April 1944, 15-year-old Gross was ripped from his life in Romania to become a prisoner at Auschwitz. His first day, he remembered being told, “See that smoke? That will become your parents.” He endured a barefoot march in the snow, a brutal work detail carrying 55-pound bags of cement and an eventual 200-mile death march to Dachau. Gross barely survived starvation with small pieces of bread and a rare potato, a delicacy he’d obtain from nicotine-desperate prisoners who’d trade him for the cigarette butts he’d cleverly retrieve while cleaning Nazi toilets. When Dachau was liberated by the American Army on April 29, 1945, Gross weighed an emaciated 85 pounds. He had lost his parents, three brothers and a sister, as well as too many extended family members to ever get a precise number. Ultimately settling in Philadelphia, Gross married and had three sons, but never discussed his Holocaust experiences with any of them. He was privately trying to unlearn a dark worldview. Gross discovered the antidote to his sorrow and isolation was to be generous. And after more than six decades of silence, he began yearning to tell his Holocaust story, so that those dark days should never be forgotten. We at the Jewish Federation were there to amplify his voice. Through our annual Holocaust Youth Symposium, Gross now speaks with hundreds of students of all faiths each year. He has received hundreds of letters from teenagers moved by his lectures. And not a moment too soon. A recent study by the Jewish Material Claims Against Germany found that 41 percent of Americans ages 18 to 34 thought 2 million or fewer Jews were killed in the Holocaust; 66 percent didn’t know what Auschwitz was. Holocaust educators say no teaching tool can compare to the voice of an actual survivor. For Gross, strength is cyclical. Our communal strength helps bolster him and, in turn, he strengthens us. 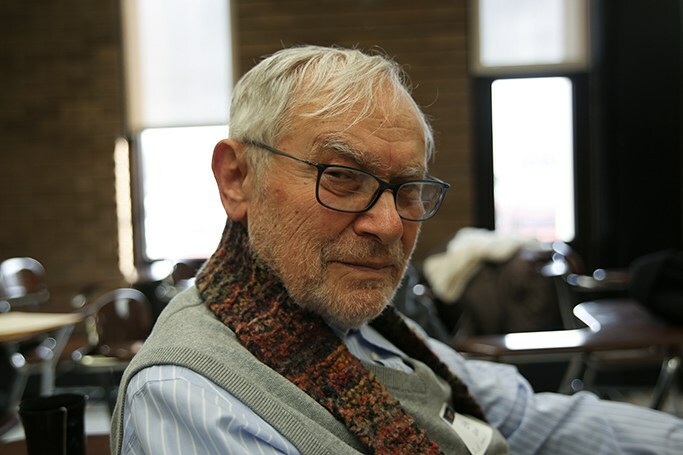 As an active member of his KleinLife community, he joyfully contributes to the lives of others; as a Torah reader, he keeps his shul thriving; and as a participant in our Holocaust programming, he selflessly keeps history alive. We should all aspire to be as strong as Gross. When you are strong, you know what you believe in, what you stand for and, therefore, who you are and with whom you stand. Next Article Gena Turgel, who tended to a dying Anne Frank at concentration camp, dies in U.K.